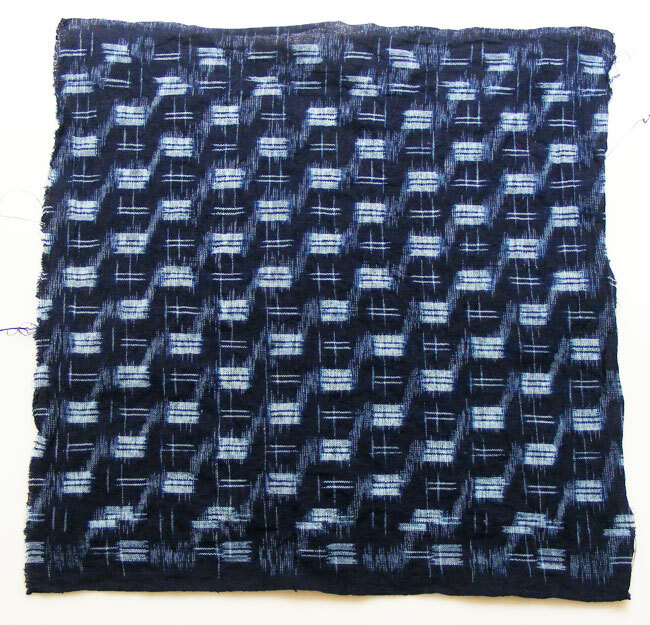 Along with shibori and sashiko, I am a sucker for kasuri (絣). 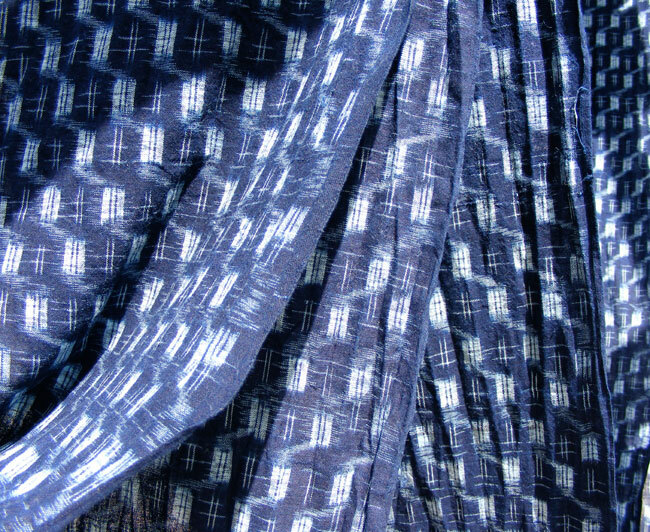 Popular in Japan since the Edo era, kasuri (or gasuri) is a double woven ikat, meaning the threads are dyed prior to weaving and the design is in both the warp and weft threads. 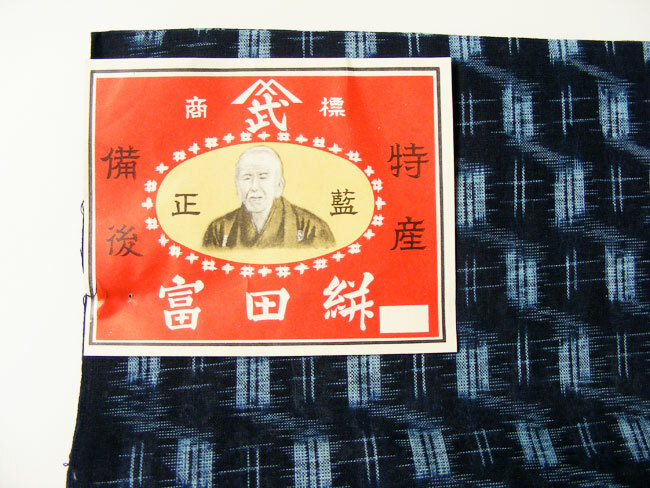 Machine woven Bingo kasuri, which constitutes the bulk of 20th century Japanese kasuri on the market, originates from Hiroshima Prefecture. When I first saw this bolt online I had to have it. Once it arrived I was quite please with it… that is, until I removed it from the cellophane package it was wrapped in. First off, the bolt smelled terrible. It likely dates from the early to mid-20th century (Showa era) and has been sitting in storage in a relatively humid climate for decades. Not good. Second, the color wasn’t as bright as I’d first assumed from the photos I’d seen. 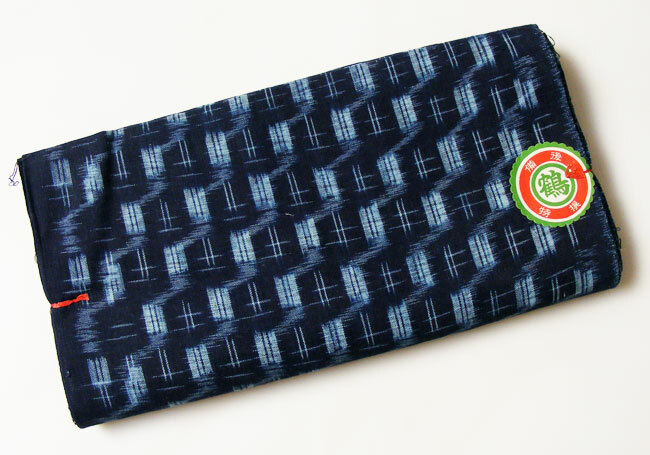 However, while I assumed it would be quite stiff as it is a machine woven kasuri, I was surprised to find it pleasingly soft to the touch. 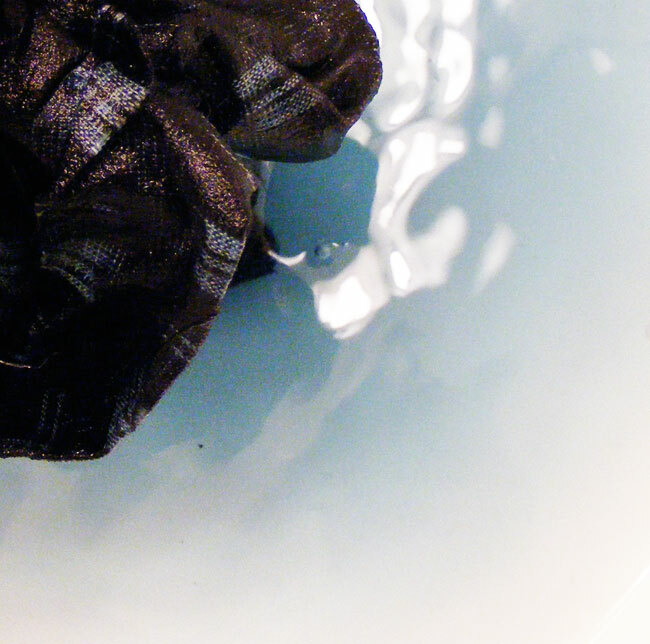 Unsure whether or not the dye was natural indigo or synthetic, I decided to find out what would happen with a bit of washing. I cut a a piece 13.25” x 13.5” from the bolt end to experiment with. First, I rinsed it in plain water. Already you can see quite a bit of dye bleed. Next, a wash in Dr. Bronner’s liquid soap (a very mild and pure castile soap, not detergent). Another rinse, then more soap. There was still more dye bleed, so much so that I decided to just wring it out and put it outside to dry while I worked on other things in the studio. Once dry, I compared the washed fabric with the rest of the bolt and found that not only did it smell better, but the color was brighter, clearer and more vibrant. There was some shrinkage, as was to be expected, but not too much. 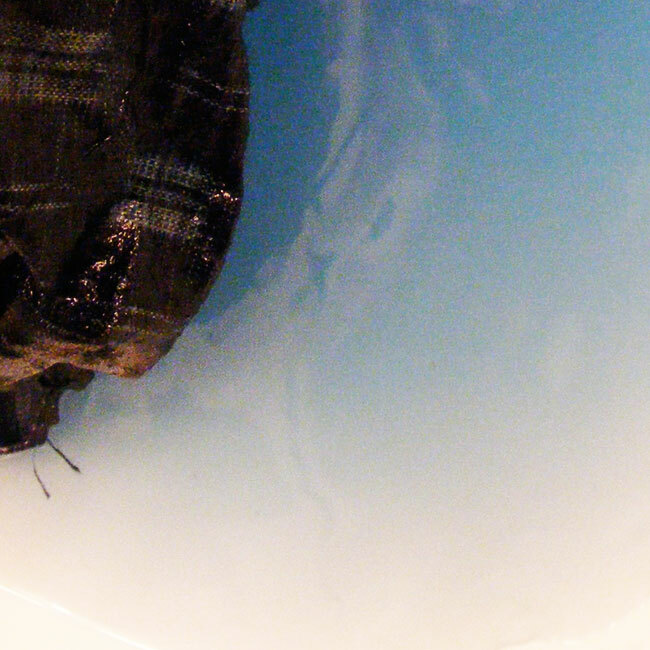 At no point was the fabric subjected to heat… mainly because my iron was still missing from last week’s painting endeavor. After confirming that washing was indeed an improvement, I crammed the rest of the bolt into the washing machine, added at least a half cup of Borax and a dose of Seventh Generation liquid detergent and set the machine to “cold” and “extra rinse.” Here it is hanging in the afternoon sunshine. The weave is quite broad and the fabric dried quickly. In the process of hanging the bolt, my hands were again dyed blue, which told me that one wash in cold water would be the beginning of a longer process. Sure enough, a search online for dye setting solutions showed me that vinegar, commonly suggested for setting fugitive dyes, would probably not be as effective in this case as a simple hot water wash. Back into the washer with Borax and detergent went the bolt. By the time the second wash finished and the fabric was ready to hang, the yard outside was no longer in full, direct sun. I left it out until dark, mainly to give it more time to air out. Part 2 will post tomorrow. Seriously! I’ve already written it and everything. Looking forward to hearing the rest of the “adventure”. 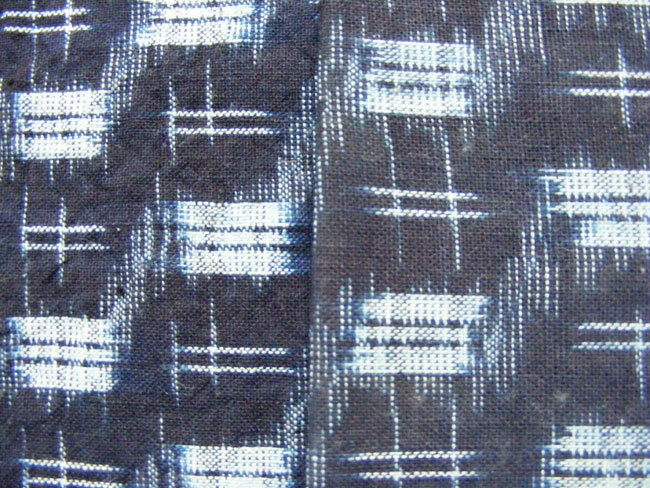 I love Ikat fabrics! Detty, my suggestion would be to wash it as gently as possible in very mild castille soap, rinse well, hang dry, and keep it out of direct sunlight. It sounds lovely! sunlight`/ no chance here at the moment.Thanks so much for yr helpful comments. Always have a Pile of washing to do , just back from France with some lovely bits of things – the best were sitting in a damp pile under a leaky window in an old brocante. Just waiting for some finer weather, meanwhile things that smell have to sit in the shed, I know from bitter experience that the mould spores are Bad.Be careful everyone!